Check the start menu too. Maybe there is a link to its uninstaller under its program shortcuts folder. You could also try and install the program again and then see if the entries to uninstall it are now available in the control panel. If not, see if Uninstall programs in Windows using the Registry helps you. Thanks for trying to help HappyAndyK. I did check the start menu and oddly Windows Double Explorer seems to appear with the name Dual Pane Windows Explorer. However when I select it, no drop down or drop side menu appears. I'm brand new to Windows 7. In XP when I selected a program in the start menu any attendant menus would immediately display. In Windows 7 none of the programs shown seem to do this. Obviously I still need to learn more about how 7 works. 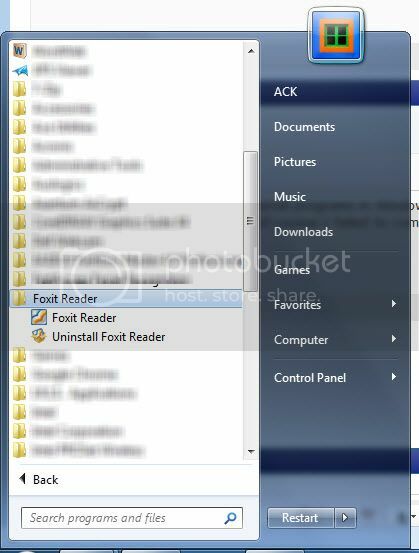 Do you know the steps necessary to get 7's All Programs menu to display adjunct menus for each program in the list, provided of course there are any? Meanwhile, I will check into the link you sent re: "Unistall programs in Windows using the Registry. HappyAndyK - I went to the Uninstall programs in Windows using the Registry link you suggested and followed the instructions there. Very interesting. Unfortunately I did not find anything listed that indicated Windows Double Explorer or Dual Pane Windows Explorer, so of course I failed to come up with a corresponding Uninstall String. Good idea though. I guess this thing has just seeped into the fabric of Windows Explorer. See if you can find its folder and click on it to see its contents. Then if you can see an Uninstaller there, click on it to uninstall the program. The other options have been suggested above. If you are not familiar with the registry, I suggest you dont use that option. You could instead simply use the system restore function to restore your computer to a point, before this software's installation.